'Yanov Trainyard 5' | Flickr - Photo Sharing! 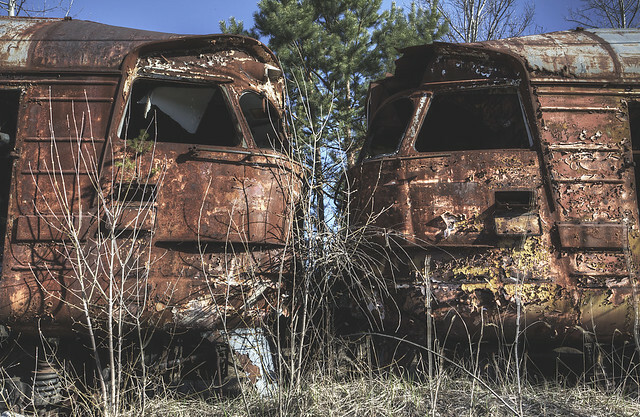 This abandoned trainyard is only one of its kind as it is on the site of the Chernobyl Nuclear disaster. The rusting carriages, piles of metal debris and what remains of the platform make it a far cry from the bustling station that once welcomed people from all over the Soviet Union to work at the nuclear power plant. After the disaster, passengers arriving at Yanov station were immediately put on evacuation buses and sent back out of Pripyat. Today, the town is within the Chernobyl exclusion zone. Named for the nearby Pripyat River, Pripyat was founded on 4 February 1970, the ninth nuclear city in the Soviet Union, for the Chernobyl Nuclear Power Plant. It was officially proclaimed a city in 1979, and had grown to a population of 49,360 before being evacuated a few days after the 26 April 1986 Chernobyl disaster. Access to Pripyat, unlike cities of military importance, was not restricted before the disaster as nuclear power stations were seen by the Soviet Union as safer than other types of power plants. Nuclear power stations were presented as being an achievement of Soviet engineering, where nuclear power was harnessed for peaceful projects. The slogan "peaceful atom" (Russian: mirnyj atom) was popular during those times. The original plan had been to build the plant only 25 km (16 mi) from Kiev, but the Ukrainian Academy of Sciences, among other bodies, expressed concern about it being too close to the city. As a result, the power station and Pripyat were built at their current locations, about 100 km (62 mi) from Kiev. After the disaster the city of Pripyat was evacuated in two days. mariburg, kevolution15, and 60 other people added this photo to their favorites. Congrats! This awesome picture of an abandoned train or locomotice has been selected for featuring in my latest post on ViralTwister.com. Feel free to add as many quality images to the group of things left to rot, like cars, trucks, machinery, even derelict trains and planes, or other great things you see in a non-operational situation.